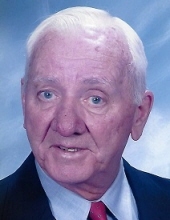 Theodore L. Uhlman, Sr. "Ted" of Cherry Hill, NJ, died January 10, 2019. He was 91. Beloved husband for 63 years to Catherine T. (nee Ferguson). Loving father of Ted Uhlman Jr. of Perkasie, PA, Bruce W. Uhlman (Marina) of Ledgewood, NJ and the late Brian Uhlman. Devoted grandfather of Kelsey, Kristen, Elliot and Lydia. Dear brother of the late Walter Uhlman and Jane Smith. Relatives and friends are invited to attend the visitation Thursday morning 10 to 10:45 AM at St. Thomas More RC Church 1439 Springdale Road, Cherry Hill, NJ 08003. Mass of Christian Burial Thursday 11 AM. Entombment Calvary Cemetery, Cherry Hill, NJ. In lieu of flowers contributions in Ted's memory may be made to The St. Vincent de Paul Society at St. Thomas More Church 1439 Springdale Road, Cherry Hill, NJ 08003. Please visit schetterfh.com to share your condolences with the family. To send flowers or a remembrance gift to the family of Theodore "Ted" Uhlman, please visit our Tribute Store. "Email Address" would like to share the life celebration of Theodore "Ted" Uhlman. Click on the "link" to go to share a favorite memory or leave a condolence message for the family.